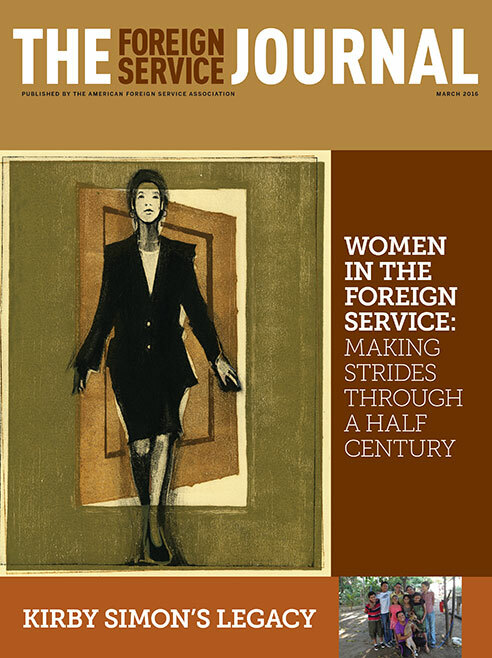 The March issue focuses on women in the Foreign Service. Foreign Service women in Panama are rejuvenating the Federal Women’s Program as a platform for career development. Here is a set of practical recommendations drawn from the experience of an accomplished USAID Senior Foreign Service officer. In the Middle East, one female officer found embassy management a greater obstacle than the conservative local culture. Maxine Desilet’s letters home, accented by excerpts from her efficiency reports, paint a vivid picture of life in the postwar Foreign Service. Female members of the Foreign Service of the 1950s through the 1990s break through barriers at the Department of State. The J. Kirby Simon Foreign Service Trust is uniquely committed to expanding the opportunities for community service to people associated with U.S. embassies and consulates. Foreign assistance is part of America’s cultural DNA, fostered by the country’s revolutionary heritage of a commitment to human rights and individual liberties. The evolution of personnel evaluations at State is reflected in the dossier of Frances Elizabeth Willis, the first woman to make a career of the Foreign Service. Stop Calling It Maternity Leave!